Louise Norris has posted a very simpsons-esque edition of Health Wonk Review at Colorado Health Insurance Insider. Of course, commentary on the Affordable Health Care for America Act is front and center. This issue is also packed with such diverse topics as limericks and Japanese organized crime bosses. Thanks to Louise for compiling a great edition. Toxic mold – Is workplace mold compensable? Roberto Ceniceros notes that this was a big topic in workers comp circles a few years back, with many predicting it would be the new asbestos. In his blog posts, he looks at a pair of recent court cases dealing with mold claims. Swine flu – The New York Times reports that the CDC will soon be releasing updated fatality counts for the H1N1 virus, with the new number closer to 4,000 deaths since April rather than the 1,200 previously estimated. While this number is still low in comparison to the 36,000 killed by seasonal flu each year, over 90 percent of seasonal flu victims are over 65 and in most cases have other health problems so it will be interesting to learn the demographics with swine flu. The new figures are expected to be released next week. Veterans – Just a few followups to Veteran’s day. Consumer Insurance Blog posted a comprehensive rundown of Insurance issues for U.S. military service members & their families. And on another note, we call your attention to one of the most heartwarming and sob-inducing posts we’ve seen in awhile – a compilation of video clips of dogs welcoming home soldiers. Is it any wonder that dogs are now playing a big role in helping vets deal with PTSD? Smart Pills – Jacob Goldstein of the WSJ Health Blog posts about a new technology that can detect if you forget to take one of your important medications and send you a text reminder – based on a microchip implanted in the pill. Exciting health innovation or brave new world? Katherine Van Tassel of HealthLawProfBlog wonders just who will be keeping track of this information? Immigration – Peter Rousmaniere posts Important 2008 statistics about immigration. Also, don’t miss his recent post on recent ICE estimates that 17,500 people are trafficked into the U.S. each year. Human trafficking is just another way of saying “slavery”- unlike illegal immigrants, there is nothing voluntary about their presence here – these are people who are abducted from homes or deceived with false promises. 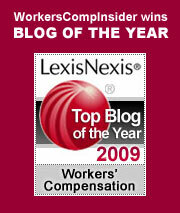 Compensability – Man plays volleyball at work and is injured. Is his injury compensable? Check it out at SafetynewsAlert.